Now that I am full speed ahead on the computer and for dial up I have more speed than I know what to do with, yeah right, LOL, I have some things I would like to share with you while I had some down time from the computer. This is just a few of the things I worked on and there is more but I will post them at another time. My painting group over at The Friendly Palette we decided we hadn't done a swap in a long time so one of the girls was painting on dish towels and they were really nice. So I asked if they all wanted to paint a tea towel and send one to each other, everyone agreed then the girls including myself that live in Canada couldn't find a tea towel that was worth painting on and was nice material. We found waffle type and other types but nothing that I would want to paint on then send to my wonderful friends and I wasn't about to try to sew them all one since I don't own a machine with a serger, forget that. So a couple of us are painting on coasters and I wanted to show you what I painted and I painted enough for the 6 other girls in the group. I didn't paint myself a set but I used to have a set like this, only this set is made from precut cork. Not sure how good the cork really is but even if they don't use them for drinks or just have on a table for decoration I am sure they will like them. 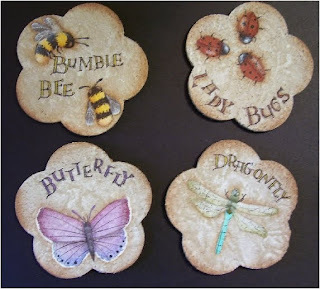 They are all summer insects and I had a lot of fun painting on them although the cork was a bit of a challenge since it was not smooth but I managed. For my birthday in May I bought myself a Cuttlebug and I recently purchased a brand new embossing folder. I had to pre order it from an online site here in Ontario before they hit the shelves I was lucky enough to get one well actually 2 new ones. The embossing folder was right up my alley with the look of gears and dials. 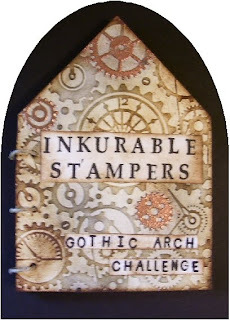 I saw a girl in my FlickR group for Inkurable Stampers Gothic Arch Challenge who had purchased an arch book to put all her creative arches in as she creates each theme. Well of course I had to go back and look at this book several times and so I went full speed ahead, and ,once I get an idea in my head it won't rest til it is done, so..... I used a program for greeting cards and found an arch template and I fooled around abit with it and made it the size I want to put ATC size arches in. I even had to design the pages to fit a certain way and measured and made some adjustements. 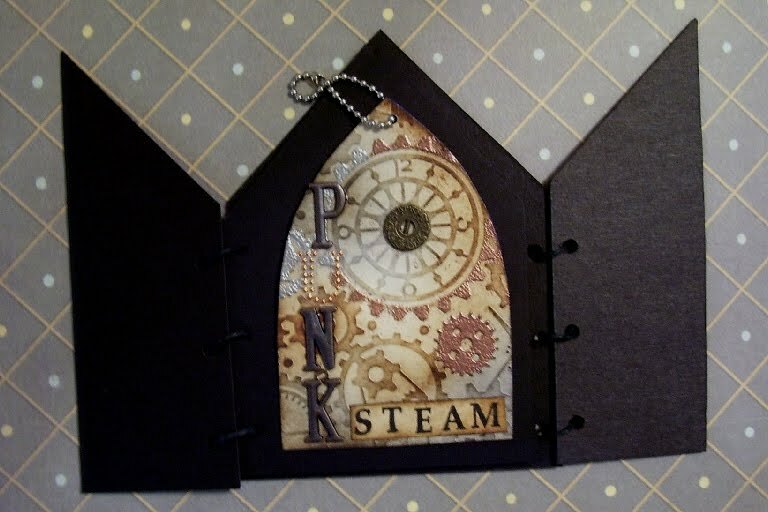 So here I have made an arch book out of chipboard, I then used my Gear Embossing Folder (EF) to emboss the paper. I then inked it with Antique Photo Distress Ink and an older black ink stamp pad. I then took a q-tip and dabbed it in Versamark Watermark Ink and dabbed it on here and there on some gears. I then took bronze embossing powder and carefully placed it on the gears and brushed away with a dry paint brush any loose powders then hit it with the heat gun. I then stamped my lettes using an alpha stamp and Black Soot distress ink and stamped the name of the challenge and I now have a book to display my arches in. 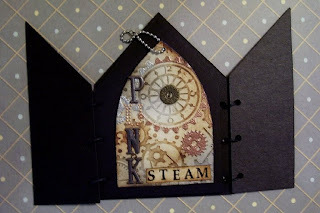 Then.......a few days later I went into Inkurable Stampers Gothic Arch challenge page since I had been offline for a few days and found out the next theme is ......Steampunk. So, I now have a similar gothic arch in a Steampunk theme using metals as my main subject with gears, ball chain at the top, my metal letters and I even embossed some of the paper with not only bronze EP but silver too. The book below is another design of book I made with the cut down the center of the front cover so you have 2 doors that open. This little book is a surprise for a friend, hope she likes it. 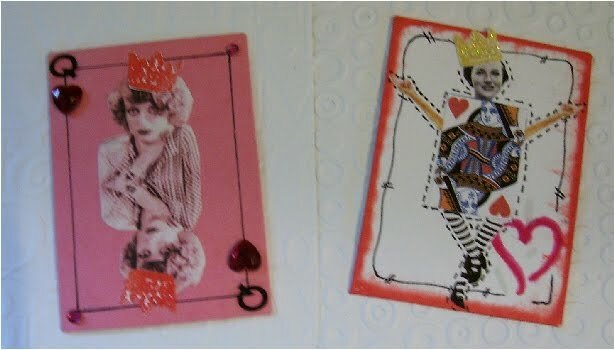 Just some fun using Joan Crawford with that wicked look on her face and the other is a Zettyish style of Queen with her body as the card and I used some flocking for the heart on that card. Flocking is so soft to the touch and a lot of fun. Never a dull moment in the studio. Next I will post a cupboard door and a canvas I painted and I am working on another pattern on canvas. I am making 2 of each design for my hopefully Nov. craft show. wow ! the down time was spent very creatively! the coasters are so sweet les, what kind of teatowels would you need, i might be able to get you some? I agree with everything Jenxo says. This looks absolutely great. Love the cuttlebug embossing plate. That's my girl she is so talented!